Chesapeake Bay skipjacks were specialized sailing vessels that were used for dredging oysters in the Chesapeake Bay. Although their popularity as a commercial fishing vessel collapsed along with oyster populations, a few skipjacks still remain in service. Chesapeake Bay skipjacks lacked strict design guidelines. During their construction, skipjacks were essentially laid out by eye and built by hand using basic boat building techniques. Chesapeake Bay skipjacks were usually 40-50 feet in length with a draft of 3-4 feet. Although variations existed, most skipjacks shared a number of basic traits including their sharp entry, flat bottom, low freeboard, and wide beam. 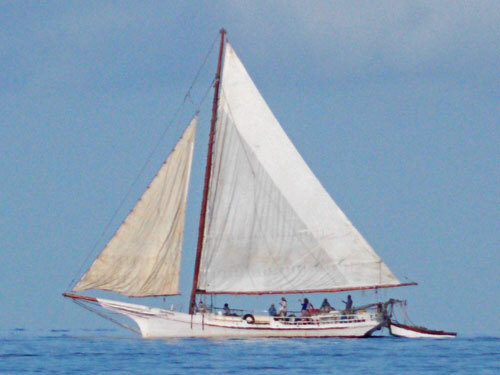 Skipjacks were equipped with a single wooden mast and carried a large triangular sail which extended beyond the stern. A self tending jib was attached to a long bowsprit. Their shallow draft, wide beam, and large sail area allowed these unique vessels to tow oyster dredges across shallow oyster reefs. With little shelter above deck, crewmen endured cold and wet conditions while oystering. Below deck, boats usually contained a stove and other essential equipment. Eventually, oystermen fitted their skipjacks with “push boats”, also known as “yawl boats.” These small, unmanned skiffs contain an inboard engine, transmission, and propeller. In parts of the Chesapeake Bay, oyster regulations restricted the number of days that engine driven vessels could work. The regulations benefitted skipjacks by allowing crews to work additional “sail only” days during the oystering season. Today, the remaining Chesapeake Bay skipjack fleet consists of private owned boats as well as a number of vessels that have been acquired by museums and other organizations. Currently, skipjacks are used as exhibits, for educational purposes, as tour boats, and other duties. In recent years, a few Chesapeake Bay skipjacks were still used for commercial oyster harvesting on a limited basis. Each year over the Labor Day weekend, skipjacks from around the Chesapeake Bay assemble for the annual Deal Island Skipjack Race. During the event, visitors tour the boats, learn about local history, commercial fishing and boat-building, and enjoy other festivities. After the fleet receives a blessing, the boats depart the harbor and assemble just off the shore. The boats race along a set course and then return to port for closing ceremonies.